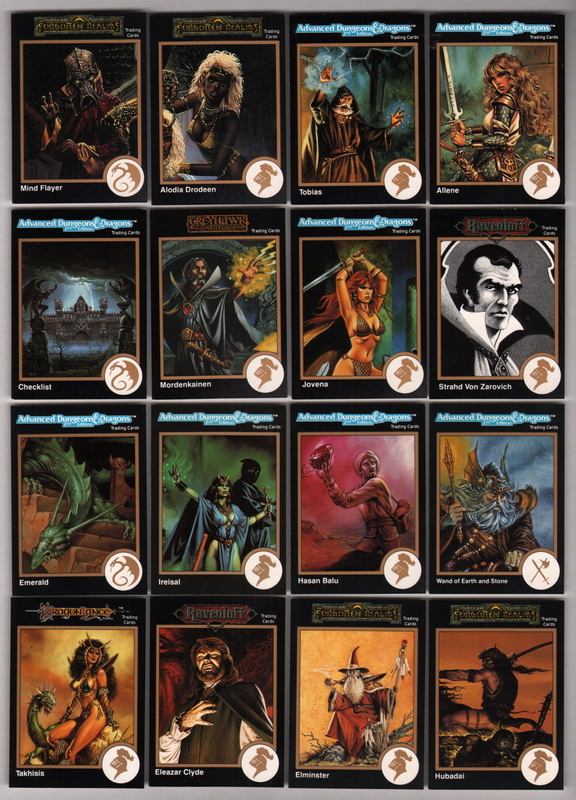 This complete set of series II Premier Edition (1991) AD&D collector trading cards includes all pack-pulled (gold border) cards. 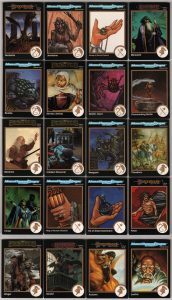 This includes all the level one rare (of which there were ten with 10,000 of each produced), all the level two rare (of which there are twenty with 13,000 of each produced), and all the regular common cards that comprised the rest of the set (i.e. cards 378 through 737). The cards are in near mint/mint condition and will be shipped with the utmost care. Scans include all thirty of the rare cards (broken down by level, and display the reverse of each card as well). There are an additional sixteen cards shown (observe side only) of select common cards. 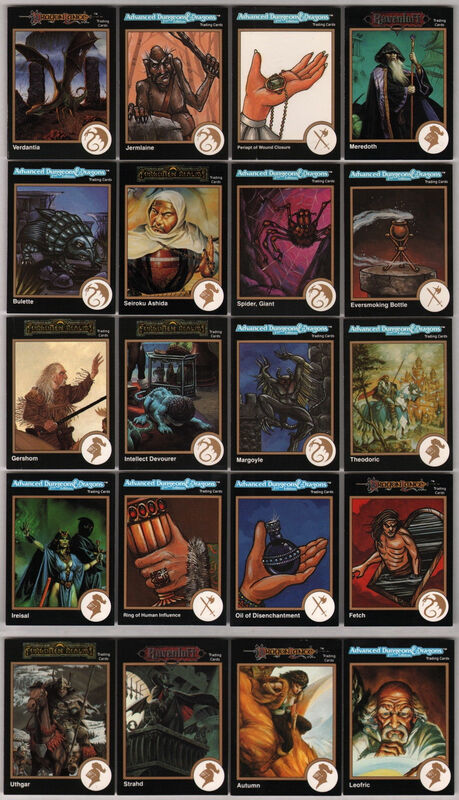 The cards include magic items, creatures, and heroes and villains from the Forgotten Realms, Dragonlance, and Ravenloft fantasy settings, including such popular characters as Lord Soth from Dragonlance and the vampire lord Strahd von Sarovich from Ravenloft. Artwork includes such acclaimed fantasy illustrators as Larry Elmore, Clyde Caldwell, Jeff Easley, Keith Parkinson, and Brom, among others. 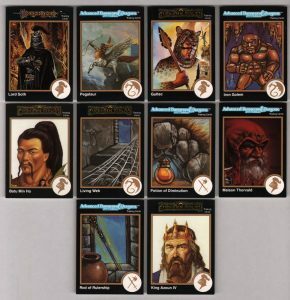 TSR pulled out all the stops for their inaugural edition trading card set, including loads of images from a vast library of amazing fantasy artwork from their most popular artists, including iconic fantasy illustrators as Larry Elmore, Clyde Caldwell, Jeff Easley, Keith Parkinson, and Brom, among others. 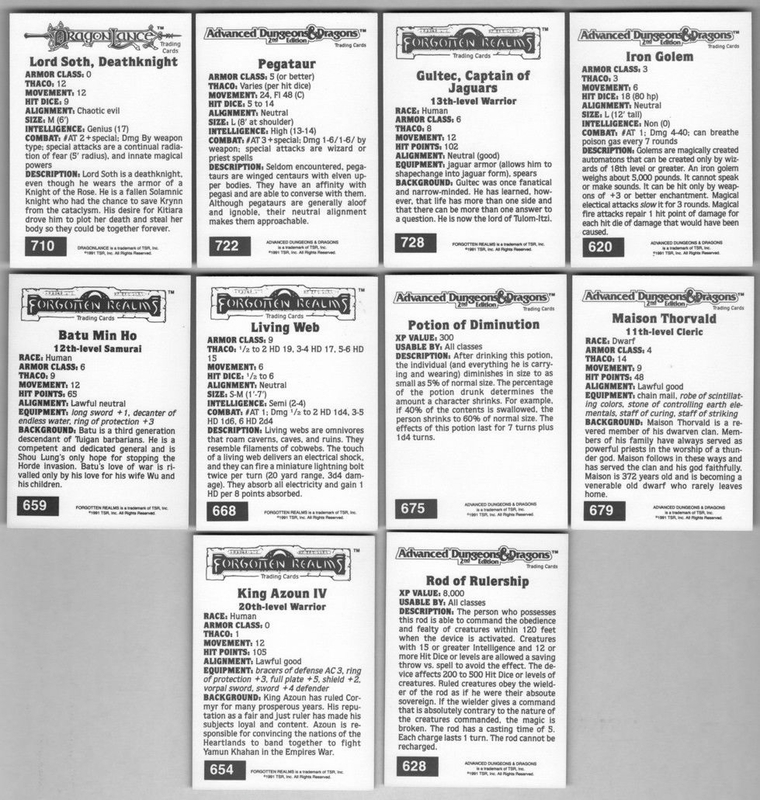 However, the set was released in the the early days of the chase card craze. In what would become common practice for most trading card companies, manufactures inserted chase cards into random packs. These chase cards were usually part of a “sub-set” and were harder to find than regular cards in the set. TSR decided to follow suit. However, they did not include any sort of chase card “sub-set” like holograms or foil cards. 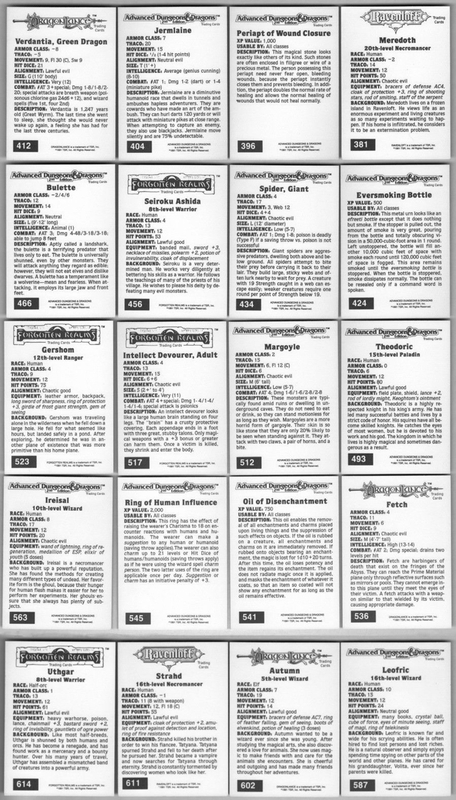 Instead, they decided that regular and randomly numbered cards from the base set would be made “rare.” So, out of the ultimately 750 cards that comprise the 1991 AD&D trading card set (all individually numbered, 1, 2, 3, 4, etc. 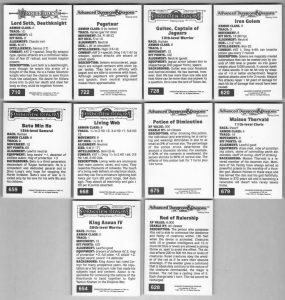 all the way up to 750) cards numbers – by way of example only – 28, 77, 262, 365, 400, 541, 710, 728 were rare cards and printed in much lower quantities than the other cards in the set. Series I was the most rare, including ten cards that only 3,000 were printed and twenty cards that only 4,000 were printed. 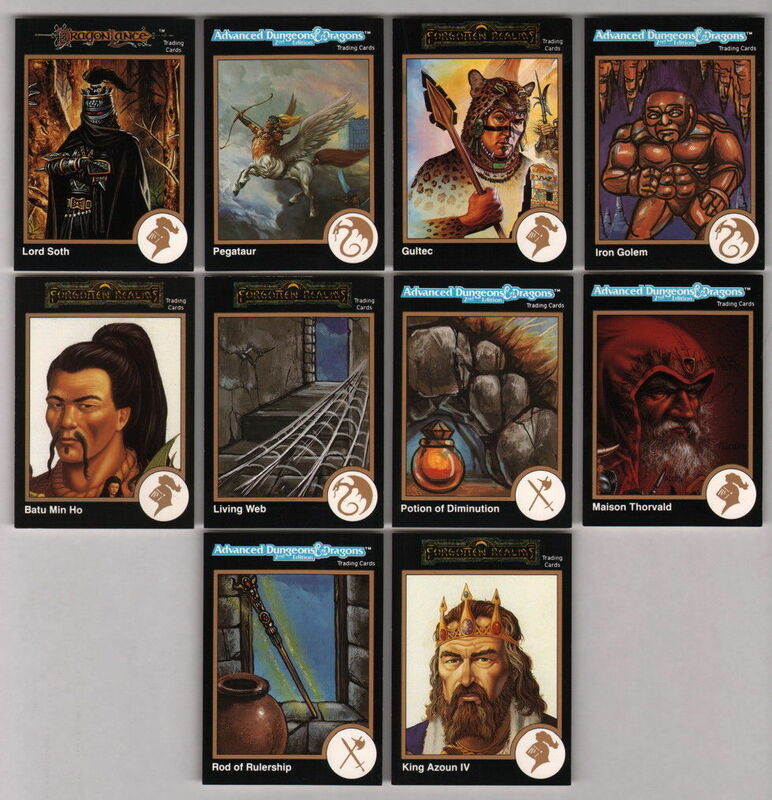 Series II featured the same, but, again, with 10,000 and 13,000 of each level of rare card instead of 3,000 and 4,000. In other words, it is only possible for there to be 3,000 hand-collated sets to exist. Given that numerous people were never able to complete their sets due to the rarity of the 60 total cards, yet having some in their hands, it created a situation to where, though it is theoretically possible to have 3,000 sets hand-collated, the actual number is vastly lower. In the over twenty-five years since this set was released, I have only seen two hand-collated sets. 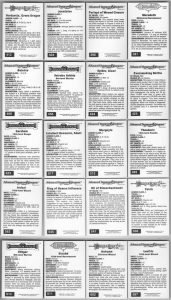 TSR did release a factory set that include all the cards, but they have “silver” borders whereas the cards from the pack have “gold” borders.